This salad can also be served chilled. Top spears with dressing just prior to serving. 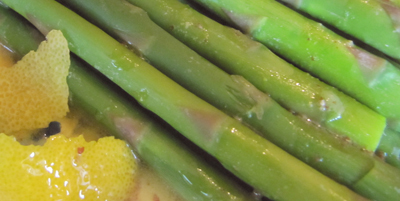 Snap off asparagus ends; discard. Place 5 cups water and 1 teaspoon of the salt in large deep skillet; bring to a boil. Add asparagus spears. Boil, uncovered, 4 to 5 minutes for thin spears, or up to 8 to 10 minutes for thick spears, or until crisp-tender. Drain well. Transfer asparagus to serving plate. Combine orange juice, lemon juice, sugar, mustard, remaining salt and pepper in jar with tight fitting lid; shake well. Add oil; shake well again. Pour as much dressing as desired over warm asparagus. Serve at room temperature.